These lines from Act III of Richard II have been chosen by director, Rupert Goold, to also serve as a prologue to BBC Television’s 2012 production of William Shakespeare’s play. This production is the first of three TV films under the title, The Hollow Crown, also taking in Henry IV parts I & II as well as Henry V. Richard speaks these words on a Welsh beach as he arrives back from campaigning in Ireland to learn that his cousin, Henry Bolingbroke, has returned from exile to reclaim the estates, taken from him earlier by the king. This beginning, and the style of what follows, evidence an approach that places Richard in a historical flow. He doesn’t just materialise at the beginning of Act I. He’s been king since he was 10 years old. He has ridden out to put down The Peasants Revolt when not yet 16. He has ridden out the attempts of the Lords Appellant to take control of government. And in 1398, in his 32nd year, when the play commences, he is confident in his empowerment by the divine right of kings. Yet the prologue tells us that history, like justice, is blind. It tells us that a king’s divine right may be challenged if that right is not tempered by care and charity. Indeed, the warning is echoed by Richard’s successor, Bolingbroke, as Henry IV, when he reflects, ‘Uneasy lies the head that wears a crown.’ And he should know. So Shakespeare understood then that what happened between Richard and Bolingbroke at the conclusion of the 14th century would reverberate on English, British and European history – not just through the ensuing Wars of the Roses – but far beyond that. And the Bard of Avon is wonderfully well assisted in bringing this least-produced of the ‘history plays’ to the screen by director, Rupert Goold and co-producer, Sam Mendes. Goold’s knowledge and working experience of Shakespeare and Mendes’ feel for visual narrative combine to achieve a compelling, organic account of how history is made by two men – not myths – but men whose very polarity obliges them to collide. 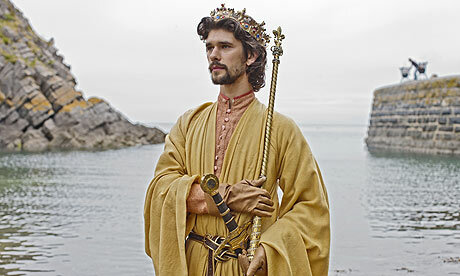 Ben Whishaw as Richard, portrays a monarch grown disinterested by his power. When his uncle, John of Gaunt (Patrick Stewart) dies, Richard, already having mocked the dying man, confiscates his estates and possessions to bolster his failing exchequer. Gaunt’s son, Bolingbroke, is banished and disinherited. What Richard does appear to be concerned with though, is developing a martyrdom complex. He appears frequently in flowing, white robes and makes extravagant gestures to the heavens. His fascination, in an early scene, with a painting of the death of Saint Sebastian, is an eerie augury for his own death. I was struck by a similarity in the way Whishaw plays these scenes and the way Peter O’Toole plays similar scenes in both Lawrence of Arabia and The Ruling Class. I suspect that may be something to do with Sam Mendes – who in turn may have been channelling Ken Russell? In any event, it’s clear that Richard is unfit for the role of king. 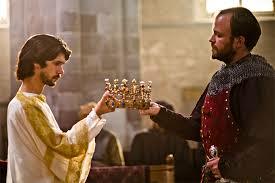 When he hands over the crown to Henry, he does so as a peevish child. So. What of Henry Bolingbroke? In the hands of Rory Kinnear, he is at first staunchly loyal to Richard and then incrementally more and more guilty as his quest to restore his name, his honour, transforms into his usurping the throne – almost as if by accident. One fault of the production is that we never get to see the crowds or the armies that would support a popular uprising and that does detract from the central proposition that the two protagonists are irrevocably bound as opposites. Shakespeare then arranges Richard’s murder to echo the death of Thomas Beckett at the hands of an earlier Henry; Zealous supporters interpreting the king’s words to rid him of a troublesome burden. Probably safer in Tudor times to rationalise regicide that way, than suggest, as historians do now, that Richard was killed by starvation and neglect, wasting in the dungeons of Pontefract Castle. A sumptuous production then, filmed mostly on location, with excellent leads and great support from the likes of David Suchet as York and Patrick Stewart as Gaunt. (His ‘scepter’d isle’ monologue delivered as a tragic valedictory is a brilliant thing) This bodes well for the following two films which I hope to view in the next few weeks. This entry was posted in Film, Literature, TV. Bookmark the permalink. An excellent piece of writing Alan. Although the names of the participants were familiar to me I have added to my historical knowledge due to your research. I must make an effort and see the series, it looks intriguing. Thanks Colin. Yes, well worth seeing and so many recognisable quotes.